(Capital Journal) – October rains had stalled many farmers trying to get their crops off the field, and this week’s early snowstorm has pushed the finish line back even further. Still, sugar beet and soybean farmer Scott Johnson is optimistic about the harvest. “We’re just hoping for some sunshine and warm weather,” said Johnson, who has crops near Manvel, N.D., just north of Grand Forks. Snow blanketed much of North Dakota on Wednesday. Grand Forks saw 5.7 inches while other places, like Larimore down to Valley City, reported more than a foot, according to the National Weather Service. “Harvest will be a real challenge,” said Brian Bjork of Forman, who had at least 8 inches of wet snow on his soybeans. Randy Grueneich, North Dakota State University Extension agent for Barnes County, which had some of the heaviest snow, said few acres of soybeans have been combined in his area. “There’s a lot of anxiety right now,” he said. Farmers, however, are still hopeful, Grueneich said, with the long-term forecast appearing to be more positive for harvesting. 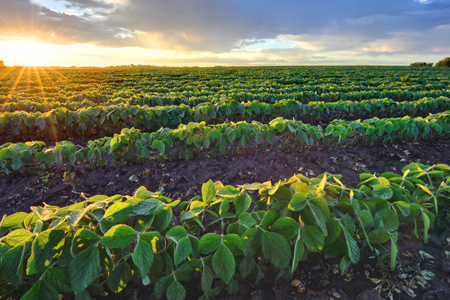 Nancy Johnson, executive director the North Dakota Soybean Growers Association said North Dakota had about 34 percent of the crop off the fields as of Sunday, according to the latest report from the U.S. Department of Agriculture. Last year at that time, 40 percent of the state’s soybeans were in the bin, and this year’s count is far behind the five-year average of 50 percent, the USDA said. The soybean harvest in Minnesota was 37 percent completed as of Sunday, ahead of last year’s completion rate of 21 percent but behind the five-year average of 45 percent, the USDA said. The first two days of the sugar beet harvest, which officially began Oct. 1, presented ideal conditions for harvesters. Then rain started to fall Oct. 3, slowly wetting the fields and eventually keeping farmers from fieldwork. The snow will delay harvest even more, said Brian Ingulsrud, vice president of agriculture for American Crystal Sugar Co.
“It’s very frustrating that we’re not able to keep the harvest going,” he said. The Red River Valley had about 44 percent of its sugar beets harvested as of Wednesday, he said, slightly behind schedule compared with other years. The wet weather shouldn’t affect the quality of beets, but the plants will have more mud to clean off. Jen Peterson-Ross of Crookston, Minn., said her farm has sugar beets and soybeans still in the field. They have harvested “some, but definitely not enough,” she said. She took an unusual photo on Oct. 10. Instead of beet diggers and trucks in the field, there was a snowmobile pulling a sled. Even with the difficult conditions, she’s hopeful they’ll get back in the field soon. “Looks like the sun may appear next week. We’ll cross our fingers,” Peterson-Ross said.